Grant Broadcasters started in 1942 when Walter Grant bought the licence for 2DU Dubbo. Walter had a hunch that this new-fangled radio thing might catch on. In fact, he believed in it so much that he spent 10 years battling bureaucracy to increase the power of the radio station’s output. In 1986, Grant Broadcasters sold the stations in Dubbo, Parkes and Mudgee and then from 1989 began to expand with the purchase of stations in New South Wales and Victoria. entered joint ventures with Capital Radio Network in Perth, Canberra and Goulburn. But that doesn’t mean we run ourselves like a big corporation. Let us tell you about our family-run culture and our commitment to the local communities we serve. Grant Broadcasters have always been and continue to be, an Australian family-run company. After Walter Grant began the company in 1942, it was passed onto his wife Christina in 1961. She ran the company until 1972 when Janet Cameron (daughter of Walter and Christina Grant) took over as Managing Director (she can be seen in the foreground of this photo). Alison and Dugald joined the Company in 1993 and then Grant joined in 2000. 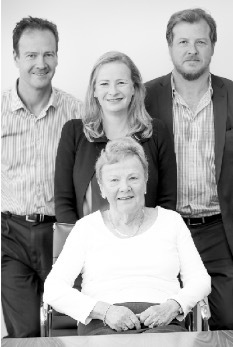 Still today, Janet is as an active board member who shares the responsibilities of running the company with the help of her children; Alison as CEO (centre), Grant as the Non-Executive Chairman (left) and Dugald as an executive member of the board (right). Though we have grown substantially since that first local station in Dubbo back in 1942, we’ve never lost our commitment to creating great local content for the communities we serve. We see our commitment to localism as the key advantage that enables us to compete successfully in an increasingly disrupted media world. Our approach to localism means we invest in local personalities, local management and staff, and form partnerships that bring the best out in both our local communities and our radio stations.